Definitely worth the money. And very fast shipping. great seller....great packing...would buy again!! Quick shipping and timely answers to my email. The soap despencer valve was broke off ..Ordered new part and received a hose ? Power washer works well but the wand that comes with it isn’t good at all. Great product, especially when I got it with an eBay coupon for 20% off. This thing is super powerful and easy to use right out of the box. I got it assembled and running in no less than 30 minutes. Did my driveway/walkway/outside stairs that evening. Then did my house the following day. Just wish I had taken before & after photos. This is perfect for residential homeowners. This is a compact , powerful unit. It powers my 20 " surface cleaner very well. 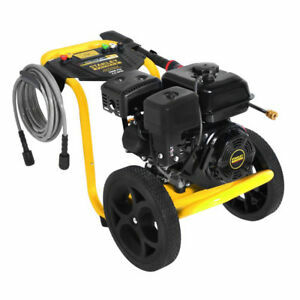 It is definitely the best value for a 3400 psi pressure washer. Good piece of equipment for commercial use, Although I had to get the on and off switch repair for $78 dollars.